Do you talk with Nature? I mean really chat it up with Her for direction? I do. Well, trees mostly. They have a lot to say sometimes about what's getting in the way! 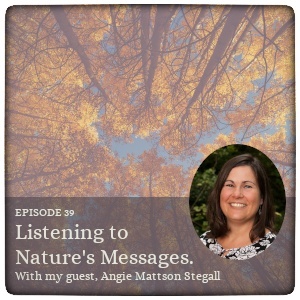 In this week's episode, I talk with my guest Angie Mattson Stegall about how listening to Nature; how She is always speaking to us, offering insight, inspiration and even a gentle nudge to move us ahead. Angie has a wonderful new book out, Notes from Nature: Tune into Your Inner Voice by Letting Nature take the Lead. In it, she shares personal stories, insightful questions, and invites you to go outside and be one with nature in order to slow down, listen, and begin hearing your own inner voice (wisdom).